Presentation Abstracts due March 13, 2017. Deadline for LowDown Showdown participants to sign up March 13, 2017. Presentation Proposals are no longer being accepted for this meeting. ASHRAE's 4th year in a row organizing or co-organizing energy modeling and building simulation conferences and 6th overall. ATLANTA – ASHRAE has announced the topics and a call for presenters for its new Building Performance Analysis Conference, formerly known as the ASHRAE Energy Modeling Conference. This year’s conference addresses energy modeling, the core topic of the past four conferences, and expanded subject matter which now encompasses non-energy building performance analysis and simulation and those professionals responsible for that work. The conference program addresses the needs of designers and modelers. Presentation proposals are due March 13, 2017 and decisions will be announced April 3, 2017. “The conference’s goal is to serve practitioners with the most up-to-date best practices, work flows and processes required to plan, design, construct and operate high performing, low energy consuming, environmentally responsive and responsible, safe, secure and healthy buildings for human occupancy,” Knight said. The conference program will include keynote speakers, invited speaker sessions, other program types and presentations and the ASHRAE LowDown Showdown modeling competition. 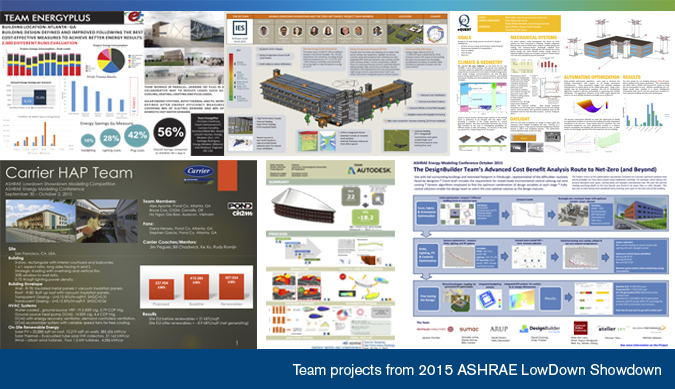 Shown below are images from 2016 ASHRAE LowDown Showdown modeling competition. Look for an announcement soon on the 2017 ASHRAE LowDown Showdown modeling competition. The 2017 ASHRAE LowDown Showdown modeling challenge will be the third event of this popular industry exercise! The modeling challenge will showcase the work of teams competing to model a net zero or below building.